Indre Viskontas, author of “How Music Can Make You Better.” Professor of sciences and humanities at the San Francisco Conservatory of Music. Adjunct professor of Psychology at the University of San Francisco. Creative Director of Pasadena Opera and director of the chamber music group Vocallective. How does your brain turn music into sound? How music can heal our minds and bodies? How can music impact society? Everyone’s got those couple of songs that send chills down their back when the opening notes are sung or strummed. On Point‘s production staff shared their favorites. Peter, Paul & Mary singing “Puff The Magic Dragon.” When I was an 8- or 9-year-old kid in New Jersey, my Greek father decided to visit family and friends for the first time since he’d emigrated to the U.S. for college. He took me with him. My very first time walking into an airplane, sitting down, buckling up and feeling the amazing surge at takeoff. We flew Olympic Airways. Eat your hearts out, young folk. In those days, that meant cloth napkins, silver cutlery, my first taste of caviar. And we’re talking tourist class. It also included a headset, the first I’d ever seen. I picked a kids’ channel. It had a pretty short loop, maybe 30 minutes long. And there were Peter, Paul & Mary, already popular in our home singing Puff. Over and over, as we flew over the dark Atlantic. As I dozed, wondered about what Greece would be like. And as my father’s inner emotions radiated quietly from him. And I cried every time it came back on. For some reason, flying often brings my emotions to the surface. You wake up way early for the flight, as you’re waking up, thinking about where you’re headed, and a sweet song comes on the radio and next thing you know, a teardrop falls into your coffee cup as you bring it to your lips. “Perpetuum Mobile” by the Penguin Cafe Orchestra: This song is so simple, but so beautiful. I discovered it a few years ago while scrolling through Spottily, and I have since fell in love with it and with the Penguin Cafe Orchestra. Somehow, it’s a great song to listen to for happy times, for sad times and everything in between. My (current) favorite song: “Everybody Wants To Rule The World” by Tears For Fears. This song brings me back to every summer adventure I’ve ever had. Not that I even particularly listened to it during the summer a lot, but the spirit of the song is energetic and excited for life. It sounds like the kind of song that would go great over a montage of all the great moments you’ve had with your friends. There’s also a bittersweet element to it that signals an end to those times and a transition into adulthood, which is exactly where I’m at in life right now! Even though it is the quintessential ’80s New Wave song, it’s absolutely timeless. Music isn’t in sound waves. It’s not in your ears. It’s not on the page. Sound can be noise in one context and music in another. The difference? How you listen and how your brain interprets the signal: Is it random noise, or is there a meaningful pattern? Just by repeating a spoken phrase over and over, you can turn it into song. Try it. Or check out Diana Deutsch’s Speech-to-Song Illusion in which the spoken phrase “sometimes behave so strangely” turns into music right before your ears. Repetition is the one feature of music that is almost universal, ubiquitous across cultures and genres, except in twentieth-century art music (“contemporary classical”), which explicitly avoids it. Which is why this “new music” can be very hard to listen to and why, when an orchestra programs too much of it in a season, they quickly hear complaints from their donors. Why repetition? Because our brains are tuned to detect change, not constancy. When something repeats, we ignore it. But if it’s slightly varied, we keep listening because we detect something worth processing. We begin to find new meaning embedded in the sound itself. Repetition gives noise a recognizable structure. Variations in repetition create meaning. And sound + structure + meaning = music. Voilà! Pattern repetition is how we learn the grammar of music, and that structure distinguishes music from random noise. Some structural elements are common across many types of music, like a move from dissonance (tension) to consonance (release). Others define specific genres, like the repeating bassline groove in most pop songs. But most pieces don’t settle for pure repetition. They include variations on themes, which keep our interest and reveal ever deeper layers of truth. Equally important in the definition of music is the context in which we hear sound. Ever wonder why audiophiles spend more time and money setting up their home stereo than their bedroom? Where we hear music can influence how our brains respond to it. In the concert hall, we sit still and listen carefully. On the subway platform, we pretend to ignore a busking musician, burying our heads in our phones. At the gym, we fill our ears with beats, tuning out the noise of elliptical machines and grunting weight lifters. Even silence, in the right context, can be profoundly musical. The eminent experimental composer John Cage wrote a piece called 4’33” which can be “played” on any combination of instruments. All the performers need to do is not play their instruments for the duration of the piece. The music is in the sounds that the listeners hear while the players are not playing. John Cage considered it his most important work. So if a tree falls in the forest and there is no one there to hear it, it doesn’t make a sound. Because sound is created by brains. Sure, the falling tree triggers compressions and rarefactions in the air, but those don’t become sound until our inner ears transduce that signal into the language of the brain. Until then, they are just moving molecules of air. Silence can be music in the right context, but without a listener to interpret the noise, even the greatest symphony isn’t music. Now you might not agree that 4’33” is actually music. Maybe your definition is more specific, including organized sound and the communication of an idea or emotion. And you’d be totally right, since it’s your own brain that’s creating and recognizing the music as such. Something special happens when our brains decide that what we’re hearing is musical. That special something is still mysterious, but it likely has to do with the structure we recognize once we’re familiar with a certain type of music. We learn structure explicitly by studying music theory, or implicitly by listening. You don’t have to go to music school to get it. “Country music is three chords and the truth,” said songwriter Harlan Howard in a Rolling Stone interview. Howard’s definition applies to just about any popular music yet leaves room for that je ne sais quoi that defines a genre and for the ideas that a specific piece communicates. Howard also reminds us that structure isn’t enough to make music musical. Music also requires “the truth.” I once did a little experiment with a chamber music ensemble to highlight this idea. We played a piece strictly according to what was written on the page. When told to speed up, we did so metronomically. When told to play louder or softer, we did, again, with no true intention. It was a technically good performance, but there was no music made. We all felt a little icky afterward. Musicality reveals a deep, dark secret of humanity: We are flawed creatures. When a performance is too perfect, it’s less human. Ayanna Howard, an engineer who builds artificially intelligent robots, told me that when a robot is too perfect, people don’t trust it. One team was engineering a robot to lead people out of a burning hospital. The robot would use real-time information from the fire alarm system to know which corridors to use and which to avoid. But the first prototype had a flaw: The humans didn’t trust it. So the engineers coded in a few errors—the robot would start in one direction, stop as if realizing it had made a mistake, apologize, and then take the correct route—people were much more likely to trust it, since making mistakes is a very human thing to do! If musicians don’t push and pull at the tempo, vary the dynamics, or give us another sign that what they are expressing is human and intentional, we can’t relate to them and we don’t find the music, well, musical. Music’s underlying structure isn’t strict. Instead, there are statistical regularities—probabilities of where the beats will fall, for example. We learn these probabilities without even knowing it, and they set up our expectations for what sounds will come next. But music is a representation of life, not life itself. 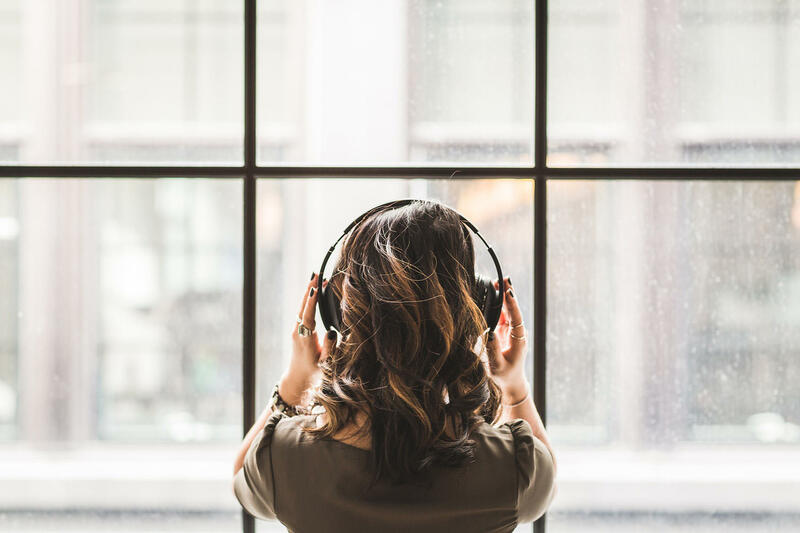 We’re generally aware that we’re listening to something that was created to give us an experience, rather than having an emotional reaction to something that actually happened to us. While music can elicit deep and authentic emotions, the musicians themselves don’t need to feel all those emotions in the moment. They just need to make the audience believe that they’re real. It took me a long time as a performer to understand this. When I was a teenager participating in a singing competition, I received a piece of criticism I’ll never forget. The judges said that I wasn’t musical. I was deeply hurt because I had chosen pieces that I truly loved and understood. But somehow I had failed to show this to the judges. I put that memory away for a long time and worked on my technique. Then I was cast as Beth in Mark Adamo’s opera Little Women. If you remember Louisa May Alcott’s book, you know Beth is the sister who dies. In the opera, she expires after a series of floating, quiet, high notes. In rehearsals, I found the aria so moving that I couldn’t get through it without breaking down. But crying is not good when you’re trying to float a bunch of high notes. So I had to keep my emotions in check while remaining in character and making the music expressive. I realized that by the time I’m in front of an audience, it doesn’t matter anymore whether I feel my character’s feelings. It only matters that the audience believes that my character is feeling those feelings. That’s true of any music: By coming into the concert hall, the opera house, the bar, or any other venue, the audience tacitly signs an agreement. They do not expect a real rendering of an event. Who, after all, would choose to lose someone they love, or feel pain or desperation (the most common themes of pop songs) in public? But by listening to music, we can simultaneously contemplate the ideas or feel the feelings, while having a conversation about how the idea or feeling is being expressed. We know it’s fake to some degree, but we can appreciate how the musicians are communicating it. In the midst of a breakup or some other loss, I can listen to Tracy Chapman’s “Give Me One Reason” and enjoy not only the emotional catharsis, but also the brilliant way she’s captured a universal experience. I can nod along and say, yeah, that’s exactly what it’s like. And then I feel a bit better and less alone. Listening to music lets us work through our emotions in a safe environment and walk away if the feelings get too intense. It provides a lens through which we can examine our lives. Excerpted from HOW MUSIC CAN MAKE YOU BETTER by Indre Viskontas. Copyright © 2019 by Indre Viskontas. Reprinted with permission of Chronicle Books. Quartz: “The idea that Mozart makes your baby smarter is one of parenting’s most persistent myths” — “Many parents think classical music makes babies smarter. “‘There is no good evidence that listening to Mozart, or listening to anything, does anything for intelligence or cognitive skills in domains that are not musical,’ says Samuel Mehr, a PhD student at Harvard who studies music’s powerful—but mysterious—effect on people. “So why has the ‘Mozart effect’ myth endured?